I saw the future of geo-visualization… after lunch | Wait... What? This is the ‘after-lunch’ part of my last blog about the cool geo-visualization tools I had the chance to learn about at the Google Partnership Exploration Workshop. (See the Before Lunch portion here for some background). The first things we saw after lunch were Google 3-D and Google Sketch-Up. With Google Sketch-Up can make whole 3-D cities and lay them on top of Google Maps. Sketch up comes in 14 languages and works off-line. Aidan from Google has used it with autistic kids and made this cool video about it to get you started. My first thought with this was how cool would it be to use something like this when we’re working with kids or communities to design infrastructure projects. 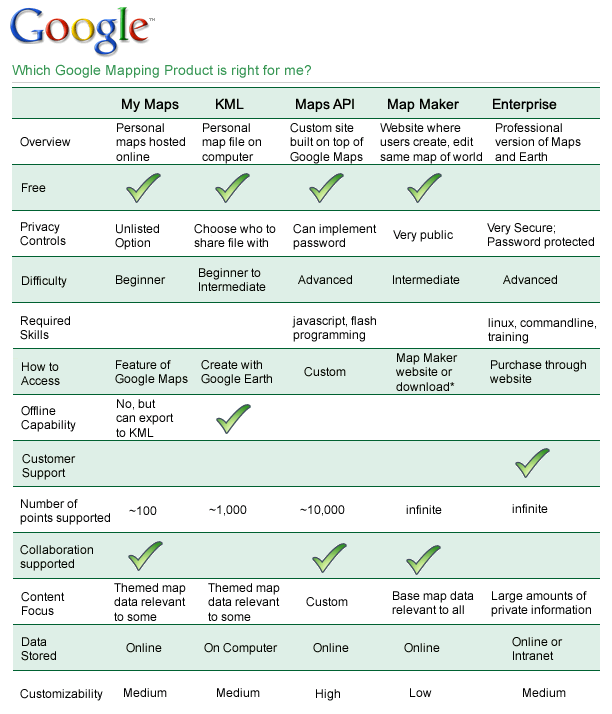 Next after Sketch-up we went through a whole gamut of Google Map applications: My Maps, KML, Maps API, Map Maker and Google Earth. It was so hard to keep all of them straight with their different features that we needed a chart (see below) to keep them straight. I am a huge fan of maps, but I mostly work with communities using hand-drawn, participatory risk/resource maps. I’d love to see all these community maps from around the world somehow uploaded and shared. Anyway, there are at least a million (I am not even exaggerating) things that you can do with these maps alone, together, in conjunction with data and spreadsheets, mashing them up with photos, videos and all kinds of things. For some of this you need to be a developer/coder, but for a lot of it you could figure it out yourself and just get on with it. Map Maker for instance is a way to crowd source map making in places that are not mapped out yet. (I’m really interested in this one). 174 countries so far are making their own maps here. There is a system for trusted users and verification to ensure the maps are correct. The entire data set for Africa is fully available for download by non-profits, government agencies and individuals to create and enhance their own non-commercial map-related projects. So Google asked us: How can we help you make the most of this new world that we live in? How can our infrastructure be accessible to you so it works for what you want to do? Getting layers of information onto maps that can be used by partners who don’t really have impetus to share information; keeping semi-private information so you won’t embarrass governments with it but it can still be shared with some to be useful. Following that brainstorm, I did my own short presentation on how Plan is using mapping with community youth and media, and how some program offices have been using GPS and GIS to create local maps on which to base their program decisions. We learned about Google Latitude, where you can track people (who allow you to) by the GPS on their phones. And then we saw a short presentation on the GeoCam Disaster Response Toolkit which is being developed by Google and NASA. GeoCam is a mobile phone application that lets you take a photo, annotate the image, select an icon to go with the photo and save. Upon saving, the data goes into a cue and uploads. It goes to a central server which has a maps like interface which shows where the photo was taken and from which direction. This looked like another cool mobile data gathering option that could be used in disasters — it’s been tested during some of the recent California wildfires. And on that note – Day 1 was over. Day 2 was equally as educational. As my co-worker and I got schooled on coding for dummies, some of our more advanced colleagues were uploading data sets that would help them make real-world decisions when the returned to their offices on Monday. Yes, I saw the future of geo-visualization!